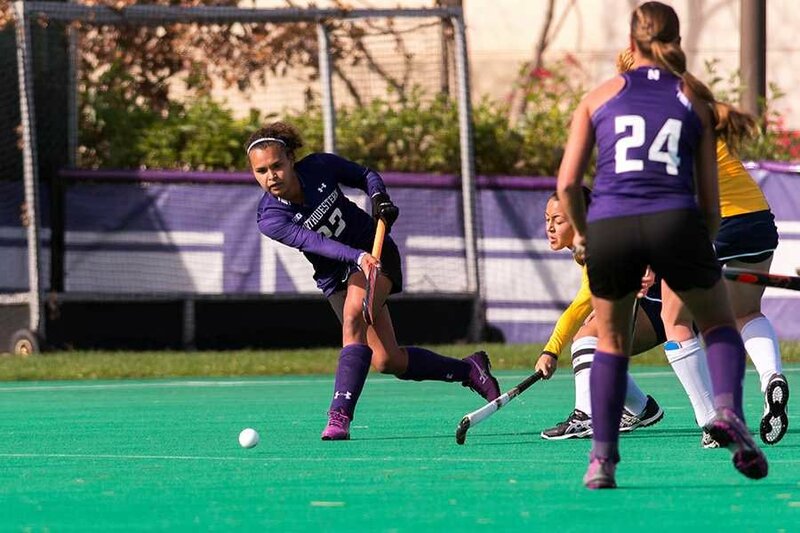 Sophomore Isabel Flens scored Northwestern’s first goal in the team’s 2-1 win over Iowa on Thursday. The Wildcats play Michigan next in the Big Ten semifinals. For the first time since 1996, No. 3 Northwestern (14-6, 7-2 Big Ten) advanced past the opening round of the Big Ten Tournament, overcoming No. 6 seed Iowa (11-7, 4-5) 2-1. With a season-high 10 saves from senior goalkeeper Maddy Carpenter and 2 goals in the first half, the Wildcats beat out the Hawkeyes. Only 36 seconds after the Hawkeyes scored the day’s first goal, sophomore Isabel Flens retaliated with a goal of her own to tie up the game. After Flens’s goal, neither team scored until less than 30 seconds remained in the first half when junior Caroline Troncelliti put her 10th goal of the season in the net. The sophomore and junior have combined for 20 of NU’s 53 goals on the season, each with 10. With her first double-digit number of saves this season, Carpenter was put to the test in goal. The Hawkeyes outshot the Cats 13-2 in the second half, the most shots NU has allowed in one half since playing Maryland in September. Despite an injury to Iowa’s top player, Natalie Cafone, early in the second half, the Hawkeyes kept the pressure on the Cats defense throughout. Overall, coach Tracey Fuchs was pleased with NU’s performance and not backing down in the face of adversity. This is the first time as the Cats’ coach that Fuchs has brought her team past the first round of the Big Ten Tournament. This game marks the first time out of three visits this season NU has come away with a win in Ann Arbor. Next, the Cats will battle the host No. 2 Wolverines on Friday at 2:45 p.m.